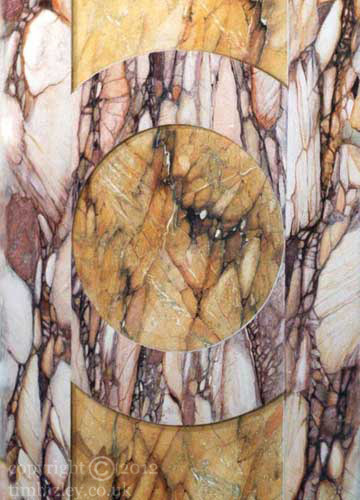 Detail of decorative panels created using faux marble specialist decoration techniques. The circular panels are of faux Sienna and the styles and rails of pass-cut Breche Violet. The panels have been given a trompe l'oeil treatment so as to appear inset. Sienna marble is broadly divided into two groups, Sienna Brocatelle (Convent Sienna is a variety of this) in which violet veins are characteristic, and other varieties such as Sienna Fleuri in which darker markings are absent. Faux marble specialist decoration using the traditional techniques of marbleizing yields the ability to transform any paintable surface into something which can confer a sense of luxury and grandeur. These paint effects are flexible enough to allow designed variations of colour, texture and pattern so that the finish might accommodate a large range of design options.